This classic perceptual illusion serves my purpose today extremely well. 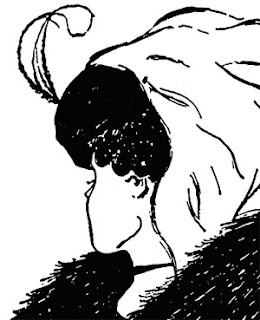 If you are not familiar with the image above take a good look and tell me if you see an old woman with a large nose looking down with her chin nuzzled in a fur coat. Or do you see an attractive young woman looking away? That image clearly demonstrates how two different, almost opposite meanings can come from the exact same picture - the exact same set of black lines on white. Now shifting from drawings to everyday problems there is a category of them I like to call "problems of perception". This is a type of problem that mentees often approach mentors with that a simple reframe can cure. I'd like to take the liberty and slightly rephrase Einstein's quote: "No problem can be solved with the same frame of mind that created it." To solve the problem one must think differently. One must in some way undergo a paradigm shift and/or question the assumptions and/or question the meaning of the problem itself. There is an excellent article on problem reframing at this link from which I will borrow a story, a quote and an idea. First off, the idea: There are two ways to reframe a situation. One can reframe the context or one can reframe the content. Context reframing is looking at a situation from a different perspective and discovering a solution from that new angle. Content reframing is to change the meaning of the actual problem itself. The same materials, dried flowers, in a different context becomes a gift rather then the refuse of remembrance. Content reframing is about changing the meaning of something without changing the thing itself. As an example, here's a suggestion I find myself making to mentees who complain of bosses that micromanage them. I ask them to think of their neurotic manager not as a boss but as an assistant! Here you have someone willing to take the time and solve your problems for you. This "boss/assistant" doesn't just solve problems for you but lays out a detailed step-by-step path forward. Fantastic! This frees you up to focus your own mind and time on solving more complex challenges, discovering more creative pursuits or learning new skills. You can't change your boss (other than by leaving that team) but you can change how you interpret and respond to their actions by changing the meaning behind those actions. To use another quote from the linked article regarding content reframing: "A famous army general reframed a distressful situation for his troops by telling them that 'We're not retreating, we're just advancing in another direction.'" The old woman/young woman illusion above is another, playful way of thinking about it. You can see two opposing visions without changing a single line in the drawing. Reframing is not just a problem-solving tool but a communication one as well. In any debate the person who controls the frame of the discussion almost always wins the argument. By setting the context of the conversation in a succinct, understandable way and inviting listeners to share that same perspective on the problem you are more easily able to guide your audience to the conclusions you wish to reach. I didn't invent reframing nor any of the examples mentioned. I just wanted to bring to light the subject both as a proven problem-solving technique and a powerful communication approach. Finally and most importantly, reframing is much more than simply seeing "the silver lining" of a dark cloud that ruined your weekend. It is about seeing the dark cloud itself as a blessing - a bringer of much needed water for example or an opportunity to stay indoors and bond with family or friends. By practicing reframing you go beyond tolerating the dark cloud and become a person that's glad it exists! I challenge you to challenge yourselves and your mentees to take a current negative situation or experience in your life and reframe it into a positive and perhaps even opportunistic (in the good sense) way.